The Inscribing Environmental Memory in the Icelandic Sagas (IEM) project is a major cross-cutting initiative of The Nordic Network for Interdisciplinary Environmental Studies (NIES), The North Atlantic Biocultural Organization (NABO) and The Global Human Ecodynamics Alliance (GHEA). The primary goal of the project is to consider evidence regarding environmental conditions and changes during the period ca. AD 850 to 1500. The information gathered will be related to how the environment was memorialized in the Sagas of Icelanders. There will be a particular focus on evidence of anthropogenic change to landscape and environment and how such developments may have shaped the writing of the sagas and their socio-environmental preoccupations. The sagas were committed to writing in the forms now largely preserved for posterity in the 13th through 15th centuries. The project thus also considers how environmental and societal conditions during this time period may have shaped an understanding of the past, including cultural foundation narratives and environmental lore. 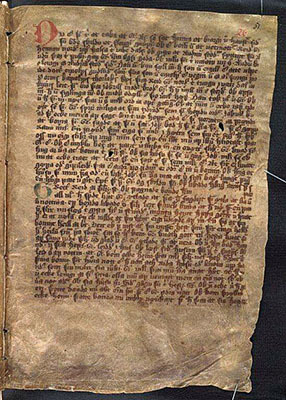 The theta fragment is the oldest fragment from a Family saga, mid 13th c. Image courtesy J�hanna �lafsd�ttir, �rni Magn�sson Institute for Icelandic Studies. These sagas are being examined alongside other textual sources and data sets that pertain to the period AD 850-1500. This time frame approximately covers the height and subsequent decline of Scandinavian sea-faring, migration and society building in the North Atlantic as inscribed in saga literature representing the Viking Age/Late Iron Age through the late medieval period. The period encompasses: the first large-scale human settlement and inhabitation of Iceland; major changes to landscape, environment and climate; various cycles of social turbulence and relative stability; the rise and fall of the Icelandic Free State; the transition of Iceland from a heathen to a Christian society; the rise of literacy and development of a particularly rich body of medieval narrative literature focused in large measure on the history, communities and environments of Icelanders, Greenlanders and other Norse and Celtic derived societies in the North Atlantic over the course of several hundred years. This time frame also happens to cover an extremely interesting period with regard to climatic and environmental changes. The project will examine historical sources that contain evidence regarding these changes, while also drawing on climate proxy data (already analyzed) in order to examine the relevance of terms such as the so-called "Medieval Climatic Optimum" and the "Little Ice Age". With a solid grounding in the environmental humanities and social sciences the IEM initiative examines environmental representation in the sagas alongside environmental markers in a variety of other documentary sources, in addition to material-cultural and palaeoenvironmental data. The initiative seeks to foreground evidence of changing environmental conditions in Iceland, Greenland and Scandinavia from the late Iron Age through the pre-Industrial period, with a guiding focus on long-term human ecodynamics and the relations among ecological change and adaptation, on the one hand, and resource management, social organization/conflict and resilience on the other. Anchored in traditional fields of study (e.g. saga studies and various medieval-studies fields) as well as newer and emerging fields (e.g. integrated history and historical ecology, ecocriticism, digital and environmental humanities, etc.,), the initiative brings together literary scholars, anthropologists, archaeologists, historians, geographers, digital humanities specialists and environmental and life scientists in a coordinated set of sub-projects. For further details please contact Steve Hartman.